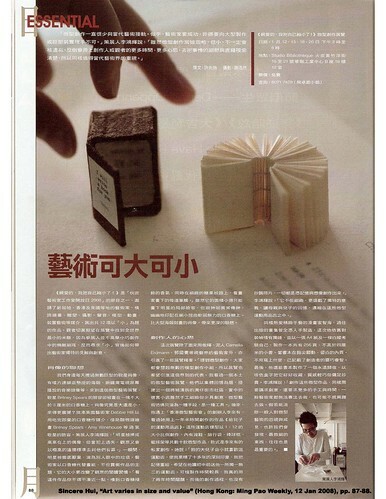 The exhibition, Eniminiminimos: Artists who make things small (Studio Bibliothèque, Hong Kong, 12, 13, 19 & 20 Jan 2008) was reviewed by Hong Kong-based journalist Sincere Hui in Ming Pao Weekly (12 Jan 2008 issue). 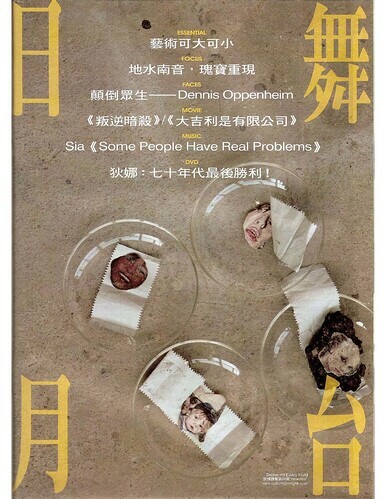 Images of works by Debbie Hill and Chihoi were featured. English translation follows the scanned pages. Publication: Ming Pao Weekly, 12 Jan 2008, pp. 87-88. As one of the programmes of Fotanian: Fotan Artists Open Studios 2008, the exhibition Eniminiminimos: Artists who make things small has invited 12 artists from Singapore, Hong Kong and Britain to who engage with the theme of ‘small-size’ through a variety of forms: miniature book, sculpture, photography, sound art, model, animation and installation. Although it does not feature landscape paintings on a grain of rice by professional miniaturists, the exhibition focuses on how contemporary artists engage with the issues of interpretation and creativity through the miniature.